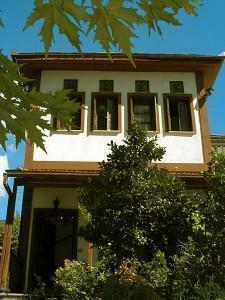 Running spring water, stone fountains and traditional mansions are the setting for this area of Pelion. This simple traditional Inn has five comfortable rooms and a lovely garden, a perfect base to explore the area. All five of the rooms of Drakia are tastefully furnished in the traditional style of the area, with warm wooden furniture and stone adornments. The rooms have either twin or double beds, color television, and central heating. All have private bath. The rooms have lovely views of the garden and the surrounding village. The central lounge of the inn has a stone fireplace and a breakfast area, with homemade marmalades and freshly-baked bread. During the warm summer months, the outdoor garden is a perfect setting for breakfast or afternoon relaxation. Drakia Village is 18 km (11.2 miles) from the city of Volos, and 8 km (5 miles) from Agria Beach.